We have 3 more Kyeezee, also know as Burma Bells to join the 12lb large one that dates from 1904. The tones of these smaller bells compliment each other and together and apart give a complex and lovely low 'dong' with little overtones and no splash. Although there are several types of Burmese gong, the most common are the temple gongs and the triangular-shaped Kyeezee or 'spinning' gong. 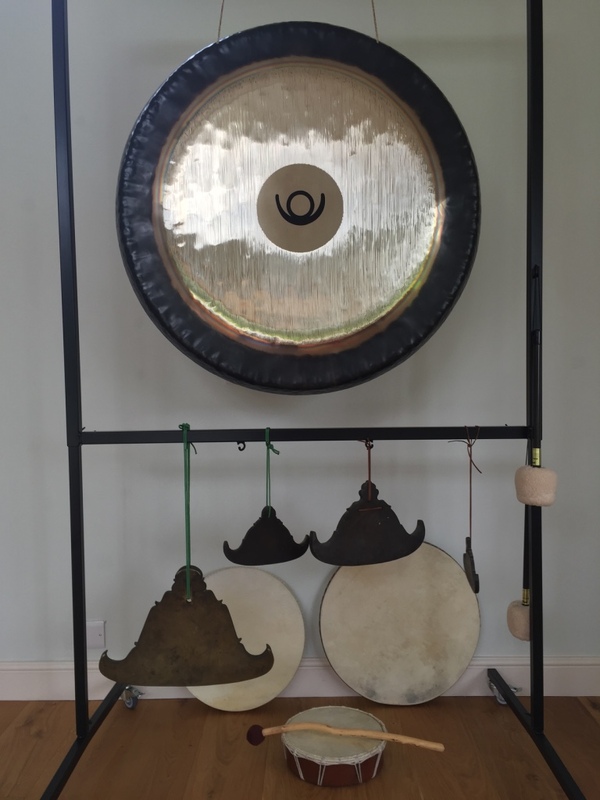 You will hear the smaller of the Kyeezee move around the room during a Gong Bath as it is easily transportable and as it spins it gives a warbling effect. The Kyeezee is a triangular shaped piece of bronze, often decorated and carved and is quite thick in the cross-section. They are often used in meditation. Below is an excerpt from Far Cathay and Farther India (1893) by Alexander Buxton MacMahon which shows how meaningful and valuable the kyeezee has been. From getting back a captive, to an item to salve the pain from being jilted by your lover, the kyeezee was there. "Their passion for the possession of kyeezees is so pronounced that it is said instances are by no means rare of their bartering their children and other near re lations for them, in subservience to a superstition that the deep-sounding note of these monotoned instruments propitiates the Nats and averts evil from themselves. In the settlement of serious quarrels, or in the redemption of captives, the in demnity with them always takes the shape of a kyeezee, with buffaloes and pigs as a make weight, just as in Western countries a concession of territory or perhaps some men-of-war is insisted on. In their social disputes also it forms an important feature, for according to Dr. Mason a girl who has been jilted can claim from her false lover a kyeezee for her body, another for her head, and a gong to cover her face for shame." The smallest Kyeezee on the right spins and as it does so the warbling tone speeds up and when it gets to the top of the string and begins to reverse, the warbling tone slows down. A Kyeezee hanging from a chain in a wooden monastery in a small village in Burma.